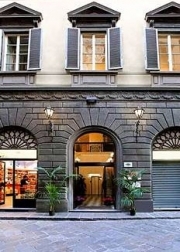 The Hotel De Lanzi is located very centrally on Via delle Oche 11, close to all tourist attractions and amenities. We are on the edge of the Piazza del Duomo, just a few minutes walk from stazione Santa Maria Novella, Florence’s main train station. The Ponte Vechio, Piazza de la Signoria and the Uffizi Gallery are all literally around the corner from the Hotel De Lanzi. There is an infinitely intriguing selection of shops in the area to suit all budgets and tastes, and we are only five minutes walk from the more functional attractions like the Conference Centre and the Station. All rooms have the luxury of hand-embroidered bedspreads typical of the local artisans, and the decor throughout is inspired by the culture that surrounds us. The satellite television, computer access and air-conditioning all add an element of familiarity and utility, so you never feel too far from home no matter where you visit us from! All bright and spacious rooms have private bathrooms equipped with hair dryers and courtesy packs, and each room has access to satellite television, direct dial telephones, internet connection and a safe. There is also the luxury of room service should you be too tired to eat out after a hard days touring. If you are flying to us the nearest airports are Florence FLR (5KM) and Pisa (85km). 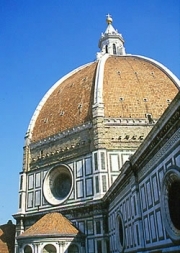 A regular shuttle service runs from Florence and Pisa is made accessible trough regular and inexpensive trains. From Rome or Milan by train there is a choice between the Eurostar and the regular train services depending on budget, and from smaller cities there are a series of very affordable regional trains. Reaching Florence by car is easy from the north or south by heading towards Florence on the A1 and taking the Firenze Nord exit. From Pisa the city is accessible along the A11 and again taking the Firenze Nord exit.